The City of London Police, in partnership with Get Safe Online, has put together a National Cyber Crime Survey. Its purpose is to learn about people’s awareness of online safety and experiences of cybercrime, with a view to improve our knowledge and understanding and to help provide a better response to victims. The results will help police forces gain a better idea of the challenges they are facing. If you have a spare 15 minutes, we would be grateful if you could complete a short questionnaire. The link can be found here:https://www.surveymonkey.co.uk/r/CybercrimeSurvey2016 . If you saw anything suspicious please contact the police on 101 and report it. Thank you. Do you know the difference between driving at 20mph and 30mph? Stopping distances, consequences of hitting a child and fuel consumption are a few things covered in the quiz to test your knowledge of the difference between driving at 20mph and 30mph. The quiz, has been created as part of a month-long THINK! speed campaign educating motorists of the consequences of speeding. We have recently had reports of suspicious activity in a local village involving people going door to door offering to clean windows and carry out general maintenance to properties. We recommend that you research online before saying yes to their services, ask for a card/ leaflet with their details and obtain a written quote. Whilst there have been no specific reports received from the police of crimes relating to Haslingfield, there are surrounding villages where the police have reported crimes relating to burglary or shed break-ins, vehicle thefts or thefts from vehicles. The police encourage everyone to take a few extra seconds to check that their vehicle or home is secure before leaving it and removing any items of value from view. Please come along to the Haslingfield Crime Prevention Event. Attendees include local PCSO Alex Giltinane, Rachel Carr Crime Reduction Officer, John Fuller Neighbourhood Watch Executive Group, and Teresa Harrold NHW village co-ordinator. Come along to find out more about how you can protect your property and reduce crime. 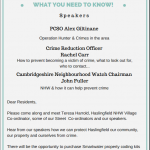 Haslingfield Crime Prevention – What you need to know! Please come along and meet Teresa Harrold, Village NHW Co-ordinator, some of our Street Co-ordinators and our speakers. 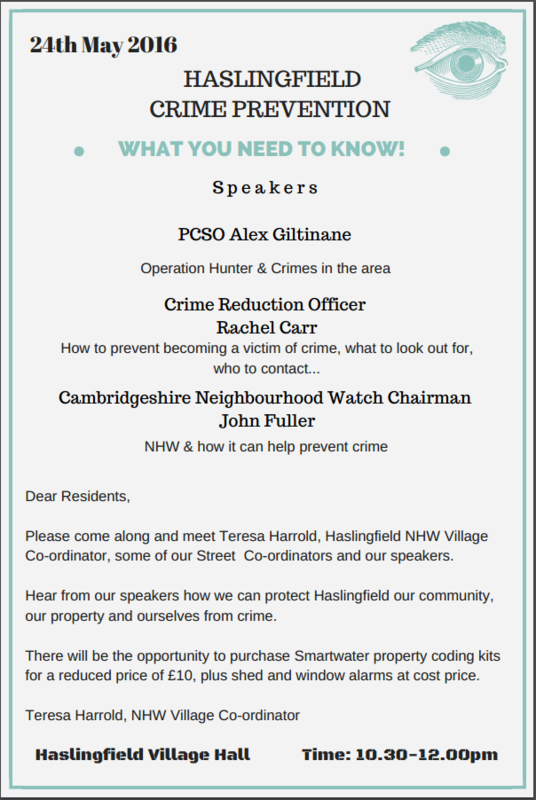 Hear from our speakers how we can protect Haslingfield our community, our property and ourselves from crime. There will be the opportunity to purchase SmartWater property coding kits for a reduced price of £10, plus shed and window alarms at cost price. Please take our home security survey ‘The Big Bad Wolf Test’ via the link below. Please use code 7156. This survey is specific to villages in the South Cambs region. One of the kneeling figures in the Wendy monument in the south east corner of the Chancel of Haslingfield Church has been badly damaged and part of it removed. 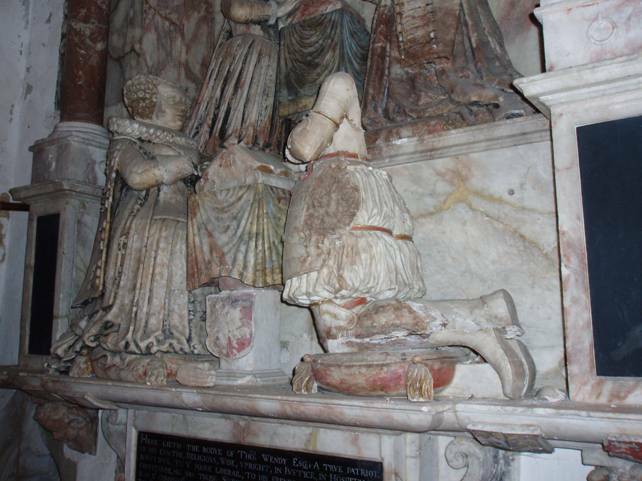 It is not known when the damage occurred but if anyone saw anything suspicious looking back over the last few days, please let one of the Churchwardens, or Harold Hopkins know; or use ‘Comments’ below. Click the picture to see the damage.